Click on the links to listen to all the tunes and find out how to play them. Choose a tune and click on the play button. Click on the links in the playlist. Learn to play festive tunes including Jingle Bells, Silent Night, We Three Kings and Deck the Halls with this sturdy music book and keyboard. 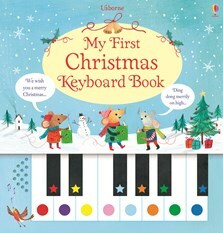 Each note is represented on the page by a different colour, which corresponds to the same colour on the keyboard, so even young children can pick out the tunes. A lovely gift to be enjoyed for years. Young children will be able to provide a musical accompaniment to the Christmas festivities with this appealing novelty book... The illustrations are very sweet.